Lifetime points are missing from the profile section of the website and show as 0 in the Marriott mobile app. However, you may be able to use the work-around referenced in this blog post to see your current Lifetime Points. See screenshot of what to click. If you call Marriott they can also tell you your lifetime points balance. http://www.marriott.com/marriott/rew...te-benefits.mi As of 20 May, this process does not work. There is no link called "Night Detail" on this page. 3. Click "Marriott Rewards Overview". At this point you're probably no longer logged in (because you've been thrown to an older version of the Marriott website), so log in again. 4. Click "Nights" under your current year's nights. -> The detail you're expecting showing LT nights and points will show up like before. To check your point and night balance, log into your account and click My Account > Account Overview > Nights. "Elite Lifetime Status is determined by your total qualified nights stayed and points earned throughout the course of your membership – including your paid nights, Elite rollover nights, meeting nights and the nights and points earned on your Marriott Rewards Credit Card." Points used by members to buyback their previously attained Elite level will be permanently deducted from their Lifetime point balance. If an elite's point level drops below that required for the level attained, they will drop down to the next Lifetime level until points are accumulated to get them back to the next level. Lifetime points in addition to nights now display on your Marriott Rewards account. When logged in, click on "Nights" (the blue link below the number representing your current year nights). You'll see the detail of what comprises your current year nights as well as your Lifetime Status nights. Thanks. I just calculated that I'll be approximately 107K Marriott points short of Marriott Lifetime Gold / Lifetime Platinum in the new program. This is without buying 50K in Marriott points in my account and 50K in my spouses account. I really wish I started reading this thread before the SPG points promo ended. It's funny, all the articles talking about the SPG points promo were focused on the travel package...ugh. I no longer travel (other than with points/award stays) so even though I'm relatively close to Lifetime Platinum in the new program, I'll likely never get there. Any other ways to generate LT marriott points without dropping a lot of money? I've already included combining SPG points into my spouses account, and transferring to her MR account, and then into mine for an award redemption which we do have planned later this year. I saw the United trick but actually need to keep my united miles for some award flights for that particular redemption. It sounds like there will be a process by which we manually click a button to combine our accounts post-August-18. If you are trying to qualify on points, I believe it's in your interest to *not* click that button until you are (new) Lifetime Plat. I no longer live or work in the US so all those lucrative credit card offers are hard to now get. It is so close to August at this point, and the responses from Marriott are so slow, it might be best just to wait. This assumes that there will be a lifetime years counter on the new combined Marriott website. I sent an email to customer support in the first week of June, and they just answered it last week. I was logged in at the time, and sent it through the website. So that request should have been flagged as being sent by a Platinum Elite, and it still took a month and a half for them to respond. I am trying to figure out how members will accrue points in the old lifetime Rewards counter after it is de-activated on August 18. Legacy SPG points transfer to new program points (3:1) and Legacy Marriott Rewards transfer to new program points (1:1), but will members still be allowed to direct earnings into the old Rewards program (in order to achieve the legacy thresholds) between August 19 and December 31? Or will the lifetime counter of the legacy Marriott Rewards program counter remain "on" for all new program accruals until the end of the year? My understanding is that it will be life as usual until you actually click the button to combine the accounts. You will be able to accrue stays at legacy-Marriott properties while SPG will still accrue stays at Starwood properties. The points will of course be combined into one area at the announced rates for earnings and redemptions. Basically, I'm expecting two different counters to continue to exist unless if you click the button to combine the accounts of course. From what I have read, if you have accounts in both MR & SPG, you will have two MPG accounts after Aug 18, one under your MR account number and the second under a new SPG account number (existing SPG numbers won't work in new system). IF you don't merge your accounts then booking SPG stays under your SPG number will be tracked separately from your MR activity. It appears once you merge your accounts then legacy rules no longer apply. Now this has not been stated specifically, but implied from what has been released. I'm not seeing any downside to keeping separate accounts for now and see how quickly the early adopters report their experiences. Maybe after Aug 18 they will actually show this data on the individual program websites.. When I hit LTP last week, my status showed up immediately on the Nights Summary page. I then received an email the following day congratulating me FWIW. Firstly, one bit of good news - it's now 600 nights and 10 years (I just found out about that change in another FT thread). SPG can tell you how many years if you email them; on the SPG Promos site it does tell me I've had 5 years as Platinum (but I'm LT gold, which may change the way it's displayed to me). On the Marriott side, some people had success with calling Marriott Rewards and having them manually work out the details, but I have had no success myself - I was on with the agent for 25 minutes as they tried to find the forumla, and them ended up just giving me the nights and points details from the website. The rep did tell me that a counter will be available on the website for the joint Marriott and SPG years after the merger of programs, but like you, I'd rather know now than be unpleasantly surprised! This may have been answered, but do night stay credits from the old Chase card (1 stay credit per $3000 spend) count toward lifetime status? When I go to my Marriott app, it seems to be including these stays on my total lifetime nights. Any thoughts? The random eligible status year was never a Marriott parameter. A night is a night in the MR program, be it a birthday night, a cc night or a hotel stay night. I think the 600 nights is for LTP, not for LTPP. 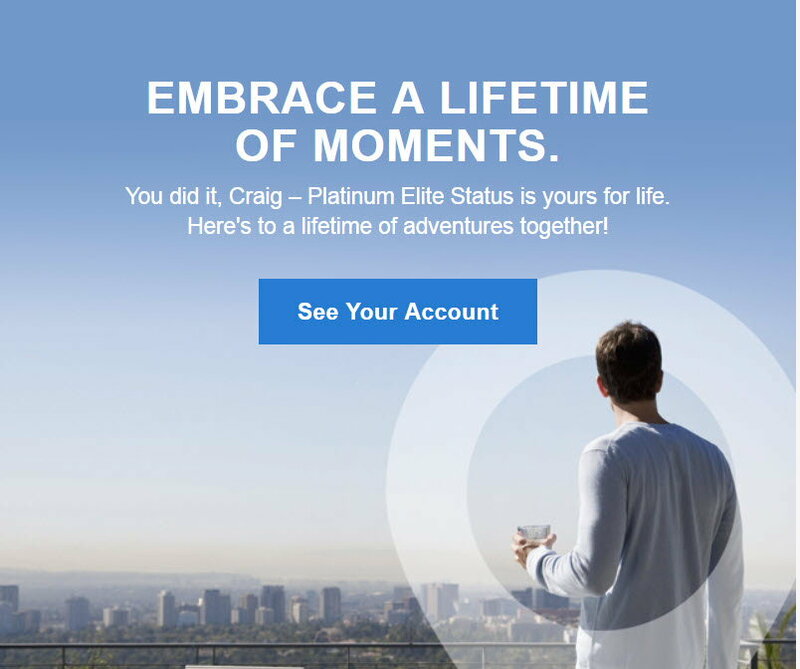 Members who reach 750 nights and 10 years at Platinum by December 31, 2018, will be grandfathered into Lifetime Platinum Premier Elite status (notified January 2019). Does Marriott alert you when you have requalified annually for Plat? I am used to SPG sending me an e-mail about 5 minutes after my 25th stay / 50th night points congratulating me. Also used to seeing the stay / night tracker watching your progress. I am now past 75 nights on the year and nada bupkus from Marriott or on the site that I can tell...thanks. I hit the Lifetime Platinum under the old criteria with 750 night and 2mm points a few weeks ago and never heard anything from Marriott. My online account also still shows me as Lifetime Silver, but a call to Marriott and they confirmed that the back-end systems do indeed show me as being Lifetime Platinum. So to echo what everyone else here has said YMMV.